You are here: Home / Toddler / Random Toddler Behavior – It’s All Hat to Me! Random Toddler Behavior – It’s All Hat to Me! Norton is the most fantastically individual boy. From the beginning, he was pretty independent. Now he’s a fiercely independent toddler who can do the most random things. Of course, I think some of his random toddler behavior is just a sign that he’s his father’s son. You see, my husband has always been a funny guy who does goofy things for a laugh. I’m seeing toddler behavior from our boy that shows he’s much the same way. In fact, I could swear that I’ve seen my husband do this exact same thing. These random things can be funny and cute things… like his beloved pillow, or even a pair of shorts. I think one of the most amusing “hats” was a BumGenius 4.0 on his head. Of course, some of the sudden “hats” aren’t always cute. 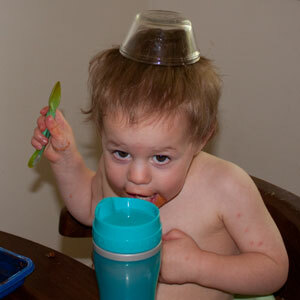 Sometimes it can lead to a very messy toddler, like when he decides his ravioli dish is a hat. Then it’s straight to the bath so that I can get the pasta sauce out of his hair. Here’s some of Norton’s greatest hats. Er, hits. Loved your photos to go with this blog. Don’t pictures really say a thousand words? Put a smile on my face this morning! Come visit me at toddlersthroughpreschool.com anytime.